THE Business Destination Travel Awards 2011, organised annually by Business Destinations, Tower Business Media in the UK, has named Bahrain Exhibition and Convention Authority (Beca) winner of the Best Meetings, Incentives, Conventions and Exhibitions (Mice) Destination in the Middle East for 2011. The award was based on the great contribution of Beca to the development of Mice in Bahrain and its continuing efforts to establish the kingdom as the preferred and unique destination for events, exhibitions and conference. The nomination to the Business Destinations’ fourth annual travel awards stemmed from the votes solicited through an international email campaign and participation by a vast and diverse cross section of voters, including corporate travel executives, company travel buyers from Fortune 500 companies, Mice solution providers, Association of Corporate Travel Executives members and the influential members of the business travel community. “The award reflects the prominent position of Bahrain as the ideal venue of events, exhibitions and conventions where the kingdom’s well-developed and expanding infrastructure, including information technology and communication, friendly trade and business environment, world-class lifestyle facilities, multi-cultured community and a steady economy, contributed largely to making it a key and strategic location for businesses and investments in the region,” said Industry and Commerce Minister and Beca chairman Dr Hassan Fakhro. “This signifies Beca’s commitment to provide superior service and achieve the highest customer satisfaction amongst the regional competitors in the industry. “The authority is also privileged to receive all support and encouragement from the leadership and the government,” he added. Beca has significantly gone a long way since its establishment in 2006 where it achieved a continuing growth in its financial and operational performance over the years. The total number of events held in the Centre rose from 43 in 2006 to 139 in 2009, an increase of 223 per cent. Of these events, trade and consumer exhibitions showcasing specialized industrial, commercial, charitable, cultural and consumer products and services totalled to 43 in 2010 compared to 28 in 2006, an increase of 54 per cent in addition to the numerous seminars, conventions and association meetings held in the Centre. 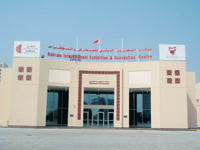 During the period 2008-2010, the Centre has attracted more than 1.2 million visitors from within Bahrain, the Gulf Cooperation Council countries and international visitors.